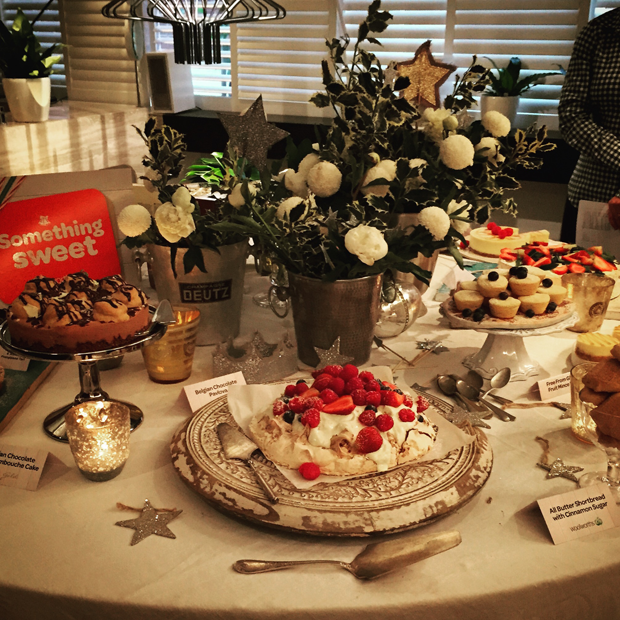 Each year I’m invited to a very exciting (and delicious) event where Woolworths showcase what we can expect in-store for the fast approaching festive season. 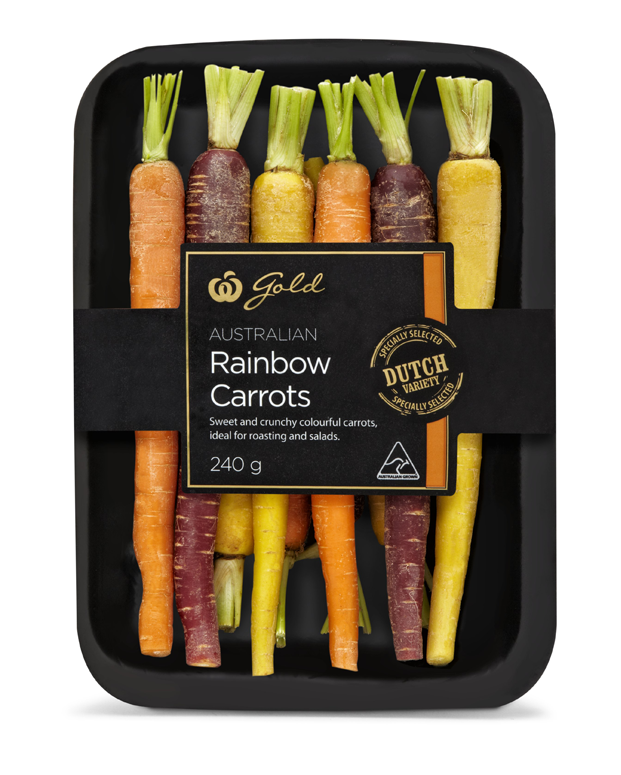 This year Woolies have some crackers (pardon the pun) in their 2015 Christmas range. The Woolworths Gold range has been a favourite of mine for a while now – I can’t get enough of the Gold Caramel Sea Salt Dark Chocolate – YUM – which you don’t have to wait till Christmas to eat! This Christmas, Woolies have the whole day covered from breakfast right through till dinner, and everything in between. You can plan your whole day totally stress free and delicious! My day, even Christmas Day, starts with coffee and Woolies have a range of Gold Coffee Capsules (10 Pack). These capsules are endorsed by Master Roaster & Blender Toby Smith, Founder of Toby’s Estate Coffee Roasters. Available in Ethiopian, Smooth, Kenya AA, Bold, Medium & Panama RRP $5.49. If you own a Nespresso coffee machine like me you’ll be happy to know these capsules are compatible. 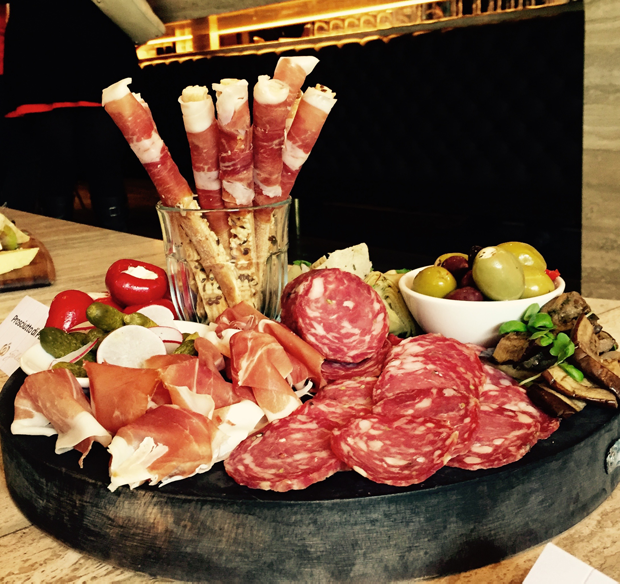 There are heaps of ideas for entertaining. 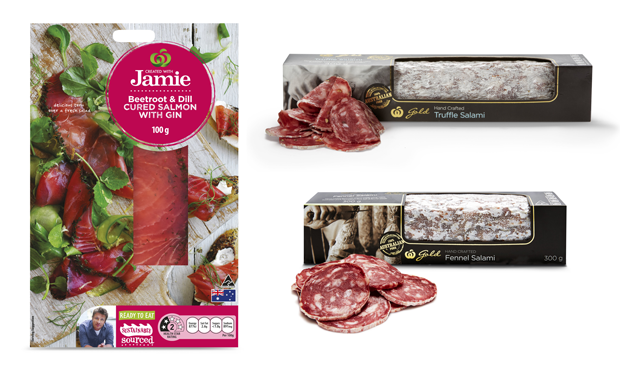 My favourites are the Cheese Palmiers RRP $2.99 per pack from the Gold Savoury Biscuit Range (pictured above) and the Beetroot & Dill Cured Salmon with Gin 100g RRP $7.50/pack (pictured below). This is a cured Tasmanian salmon, flavoured with dill and gin (yum!) and has a subtle pink colour. Then on to the main event, Christmas Dinner. 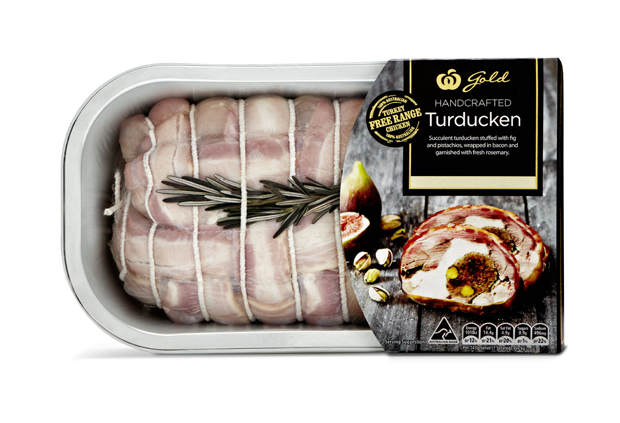 Woolies have your old favourites including the ever popular Gold Turducken. 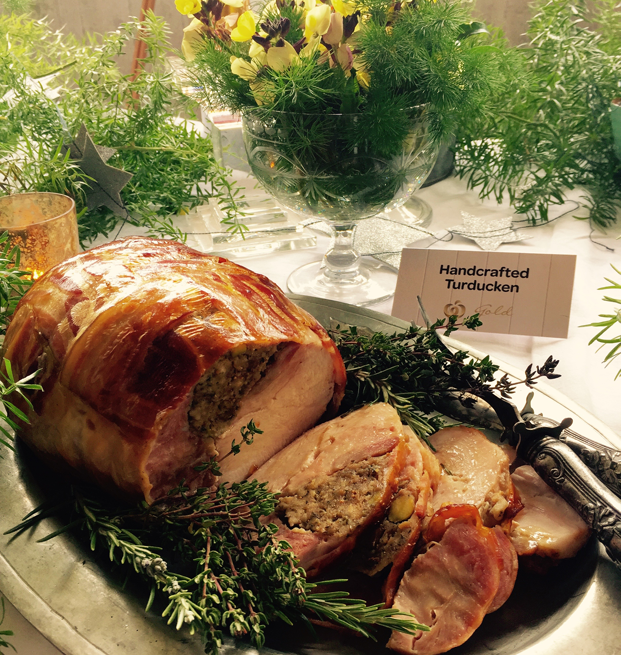 Succulent turducken stuffed with fig and pistachios, wrapped in bacon and garnished with fresh rosemary. 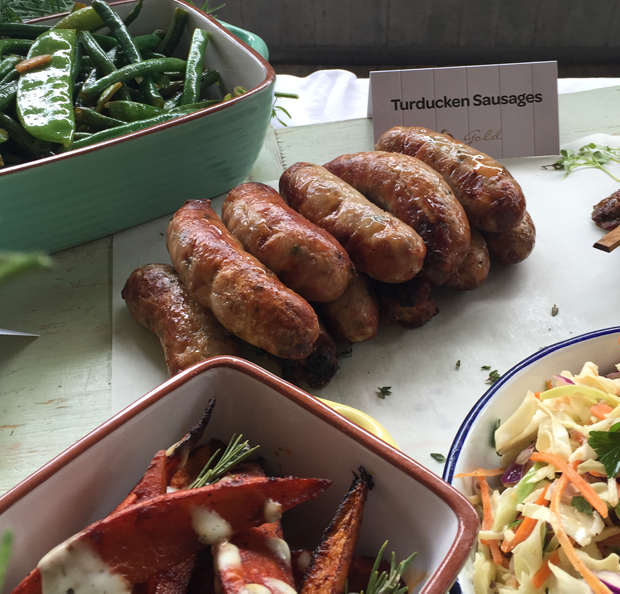 But a new addition this year is the Fresh Gold Free Range Turkducken Sausages – Coarsely Ground Free Range Turkey, Free Range Chicken and 100% Australian duck mixed with fig and pistachio in a natural casing. Who could forget the ham! 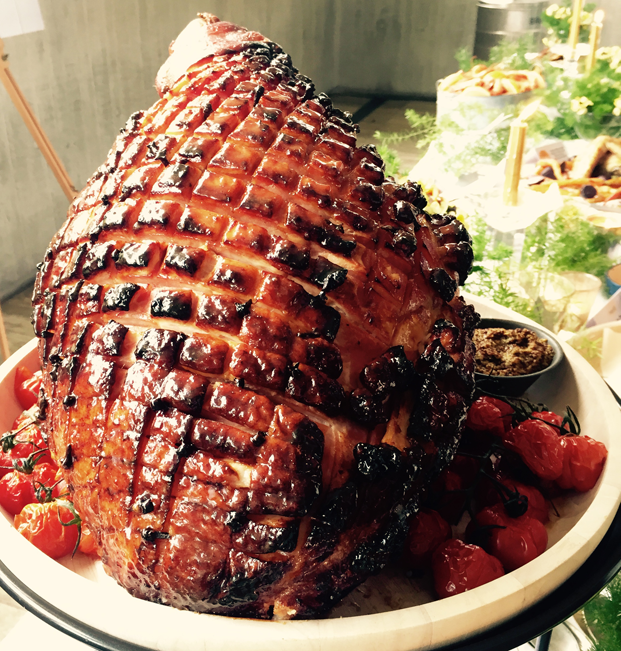 Woolworths Whole Leg Ham is made from specially selected Australian Pork and naturally smoked with Australian Hardwood. It is ready to bake with your favourite glaze and is Gluten Free. And Christmas just wouldn’t be Christmas with out the sweet treats. There is the traditional Woolworths Iced Fruit Cake 1kg RRP $10 each and Woolworths Fruit Mince Pies 6 pack RRP 3.50 per pack. I adore the Gold Golden Christmas Bombe (Available in 900g or 270g) which is lightly spiced and packed with juicy sultanas, pineapple, mango, cherries & Australian macadamia nuts all glazed with an intense passionfruit & orange liqueur sauce – Divine! Another delicious dessert choice is the Gold Belgian Chocolate Pavlova. A delicious home style pavlova crunchy yet soft on the inside, drizzled with chocolate sauce and roasted chopped hazelnuts. Something new this year is the Gold Salted Honey Caramel Cheese Cake 300g RRP $15 each (pictured below). This is decadent baked cheesecake generously swirled with a sea salted honey caramel sauce, made with Australian honey. If you are cooking for one or two and don’t want a huge dessert then the Gold Frozen Salted Caramel Baked Cheesecake (4 Pack) is perfect. 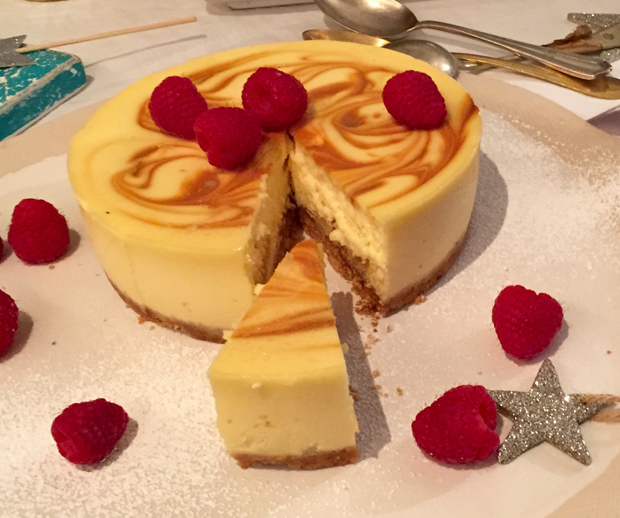 These single serve cheesecakes are made using a traditional combination of real fresh cream cheese and fresh pure cream. The caramel sauce is hand piped on the top with Murray River Pink Salt very delicately, hand sprinkled to finish. All of these desserts need to be topped (very) generously with the Gold St-Remy Brandy Cream 300g. OMG this stuff is awesome, the cream is sourced from the Western District of Victoria and is a luxurious, decadent full fat thick cream with St Remy Brandy. There are some super duper desserts hitting the Woolies shelves this year like the Gold Mango and Passionfruit Trifle with creamy layers of Madagascan vanilla bean custard and luscious coconut cake, bursting with pockets of zingy mango and passion fruit compote, all topped with toasted coconut flakes. 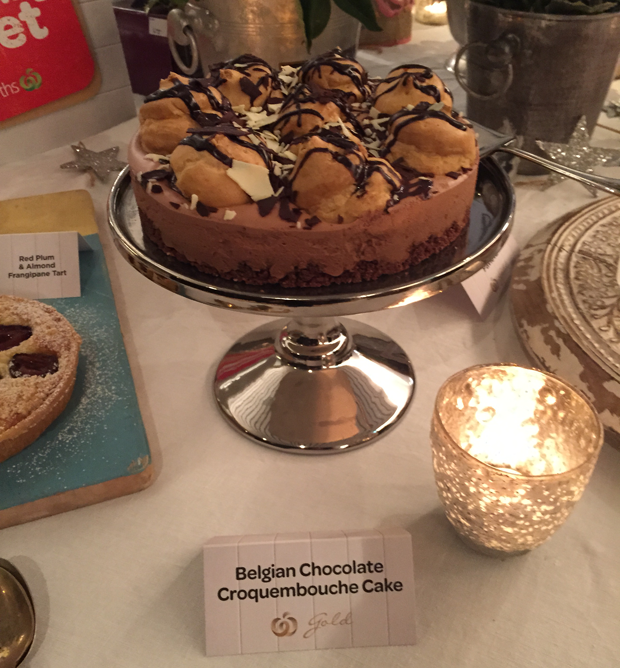 Also worth a mention is the Gold Belgian Chocolate Croquembouche Cake with Belgian chocolate biscuit base and a Belgian chocolate mousse layer. All topped with hand made choux puffs filled with Madagascan Vanilla Creme Patisserie and drizzled with chocolate sauce and a sprinkle of Belgian chocolate shards. 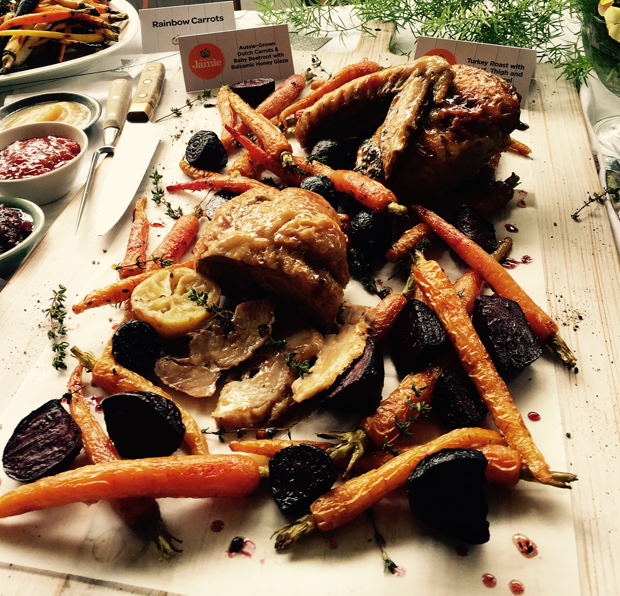 There is a whole heap of great food ideas coming to a Woolies store near you to make Christmas stress free. Helping you spend less time in the kitchen and more time with friends and family. 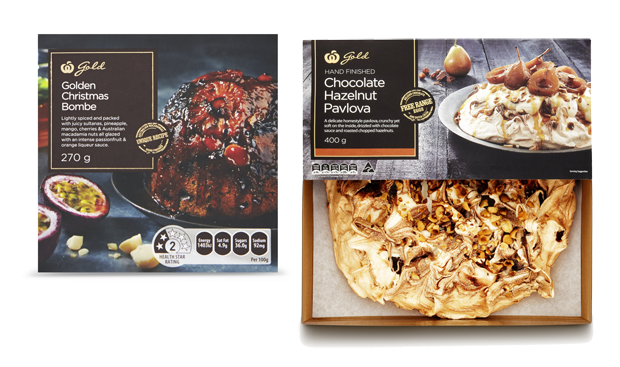 All these delicious foods will be appearing in your local Woolies during September and October, so keep your eyes peeled. If you can’t get into a Woolworths store you can shop online. Note: prices for some items mentioned in this post where not available at the time of writing.